Love and marriage, they do go together. However in our human flesh sometimes we walk through life in a marriage that becomes very comfortable — so comfortable that it is easy to forget the love part. Of course, the Bible has much to say about love and marriage. 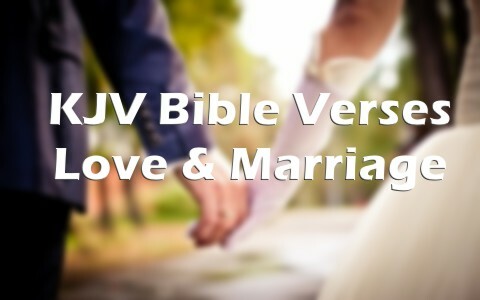 Take a look at these 20 King James Bible verses about love, marriage, husbands and wives. Marriage is sacred before the Lord because it is the earthy representation of Christ and the Church (Eph 5:32-33). I pray that these verses help you to meditate upon God’s word and how important it is to keep love in your marriage. Thanks for publishing all these Scriptures that talk about the uniqueness and importance of marriage. Having said that, it’s evident that all the issues marriage is facing has to with people unwillingness to abide with the Word of God. God has created marriage with a clear purpose in mind and He’s given guidelines that must be followed in order for people to have the best marriage as possible, but many have chosen to go below that by having miserable and unhappy marriages due to their failure to let God to occupy first place. Oh Arold, you have hit the nail on the head. Thank you for stopping by and sharing your comment here. I pray you are blessed. Thanks Pamela, blessing to you too. Aww how sweet I love these verses! Thanks for these Scriptures today. My wife and partner for nearly 20 years, and the mother of my two young daughters, told me last month that she wasn’t sure how she felt about me emotionally anymore. She says she still loves me. She has not been unfaithful (and I believe her completely). She is just emotionally dry towards me right now. I need encouragement, and God has been providing it daily…just not from my wife. God has told me numerous times during the past month that I need to “Be Still and Know I am God.” He has assured me that He has this situation covered, and I need to trust him during this valley. He is using it for my good and for her as well. It is just so hard to see it at this time. My wife and I are leaders at our church – she teaches SS, and I am on the board of elders – it is an embarrassing thing to go through. God will see us through this. I believe Him and trust Him. Encouraging verses like these bolster my spirits. Thank you for posting them! I came to this website to get some scriptures about marriage and I saw your comment. I thought it was very brave of you to be vulnerable with your feelings openly. That is the first sign of you embracing the issue. So, my husband is also a leader at our church and I once in my life I felt where you are now. I know you said you will wait on God to work it out and see you through, but you also have to start making an effort as well. What I mean by that is, ask your wife why is she emotionally disconnected. Trust me, she will give you a laundry list of things that is making her dry towards you. Start writing them down on a note pad. After you have the list, bring it before God and pray over it. Last but not lest, tackle a few things on that list slowly and thoroughly. Talk it over with her and gradually you will slowly but surely win her connection back to you. I pray for you and wish you the best! Marriage is hard work and if you want to continue being successful you have to be open to change. Such a beautiful post my sister in Christ. So precious. Thank you. Previous post: What Does Good Friday Mean to Me?